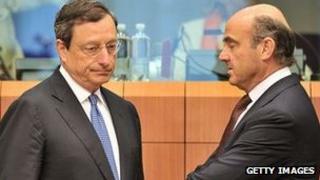 Eurozone crisis: Will the ECB's bond plan work? The great enemy of virtue - that is how 17th century philosopher Sir Thomas Browne described the multitude, or "one great beast", when confused. In modern times, the international credit markets could be seen as the confused multitude. On Tuesday, attempts by Spanish Economy Minister Luis De Guindos to rally German, French and Italian counterparts to openly back a plan to speed up the implementation of plans agreed at the last EU summit to reduce Spain's borrowing costs ended in farce as France and Italy first denied all knowledge of the plan and then, a day later, pledged their support albeit with no concrete timetable. So, it was no surprise that the "great beast" drove Spain's implied cost of borrowing over 10 years to a euro-era high of nearly 7.6% on Thursday in response. Greece, Portugal and the Republic of Ireland all had to seek international bailouts when their own borrowing costs reached similar exorbitant levels. But, on Thursday, everything seemed to change. A short sentence from Mario Draghi, the president of the European Central Bank seemed to succeed where every single eurozone finance minister had failed: "The ECB is ready to do whatever it takes to preserve the euro." The yield on ten-year Spanish bonds plunged to 6.55% in a couple of days. Mr Draghi appears to be the only voice capable of commanding the international markets. For that reason, the leader of the Eurogroup Jean-Claude Juncker and other eurozone leaders speaking over the weekend, have put the ECB at the heart of plan to drive down Spanish and Italian borrowing costs. The ECB's SMP bond-buying programme, discontinued in January, had temporarily managed to bring down the implied cost of borrowing for governments as determined by the trade between banks and other institutions of government bonds on the secondary market. However, governments' actual cost of borrowing is determined at auctions where they sell bonds direct to banks - the primary market - such as Monday's sale by Italy. So, to have any lasting effect on government borrowing costs, the ECB would need to bring down costs in the primary market. But the ECB's constitution prevents it from lending money to European governments, precluding it from buying bonds at government debt auctions in the primary market. So, under the Eurogroup plan, the eurozone's bailout fund, the EFSF, would do the buying albeit through its agent... the ECB. The ECB's SMP programme could also run along side this process by try to suppress bond yields in the secondary market. Carsten Brzeski, senior economist at ING Belgium, says the plan ticks all the boxes: "The market would not differentiate between the ECB acting alone or the ECB acting as an agent for the EFSF." "It would give the impression that there's more firepower behind the ECB whilst ensuring the ECB's independence and impose some kind of conditionality on the Spanish government," says Mr Brzeski. This last part is also important. Germany's Bundesbank and finance ministry have reiterated their opposition to lending money to governments without any corresponding promise not to squander the loans. Germany is keen not to just end up financing the perceived profligacy of governments such as Greece or Italy. Because Spain and, perhaps Italy, would be borrowing from the EFSF rather than the ECB they would have to sign a memorandum of understanding. However, because the terms of the memorandum are flexible, Spain could still avoid the humiliation of EU officials combing its books and marking its progress, says Mr Brzeski. It could also avoid being asked to go beyond its already austere spending plans. In the past, the ECB has bought government bonds in small parcels of 20bn euros ($24.5bn; £15.6bn) each week. But, former ECB economist Christian Schulz, now a senior economist at Berenberg Bank, says that is unlikely to be enough to satisfy the markets in the current climate. "It's really about the signal... after Draghi's comments on Thursday it is unlikely that the ECB will now shy away from determined intervention," says Mr Schulz. Mr Schulz cites the Bank of England as an example. It has spent the equivalent of 20% of UK national income or GDP on government debt. The equivalent in the eurozone would be a bond purchase of 1.6 trillion euros - a highly unlikely amount for the ECB to contemplate. Instead, the ECB will try to tame market expectations. It will want to make them believe that the risk of Madrid being allowed to default on its debts - represented by its 10-year bond yield - is rather closer to Germany's (at 1.4%) rather than Greece's (at 25%). Mr Schulz believes the ECB may even set a target for the difference between German and Spanish, or German and Italian bonds - known as the spread. In this instance, the ECB may only have to act when bond yields for Spain or any other nation exceed this limit. That leaves about 120bn euros and change for intervention in the bond markets. The EFSF could increase its buying power by offering to insure bond purchases made by ordinary banks, for example, offering to take the first 20% of any default by the Spanish government. If the fund could persuade investors to buy on that basis it would only need to cover a fifth of the bond costs, essentially boosting the value of the purchase fivefold to closer to 600bn euros. "That should restore some calm on the markets and at the same time keep pressure on governments to implement austerity measures and structural reforms," says Mr Brzeski. The eurozone needs to buy at least two months of breathing time. The earliest time its new bailout fund, the European Stability Mechanism (ESM) and its 500bn euros of firepower can come on stream is now September due to legal challenges in Germany. "And [eurozone countries] must use the time constructively to move towards closer integration in the eurozone," he adds. Mario Draghi has promised to "do whatever it takes to preserve the euro". So, expectations are high for the ECB's next rate-setting meeting on Thursday. Analysts say it is now crucial for finance ministers and bank chiefs to show a united front. "If, the day after the any bond purchase is announced, the Bundesbank president comes out in opposition to the move, that will decrease the effect and start to create doubt about the ECB's commitment to this measure," says Mr Schulz.